Decals are a great addition and up-sell to add to your store. BUT there are some things you need to understand before adding stickers to your store. We now offer what we call “Standard 4×3 Die-Cut Decals” in the Teescape Fulfillment App. Not all designs will work for decals. Pay attention to the preview that is created in our app of the decal. If it looks funny in any way, it probably won’t work. Please read all of the information below to understand how this works. We call these decals “4×3″ because they are printed on a 4-inch by 3-inch template. Stickers will not actually be that large, due to the spacing and how they are cut. The artwork will be sized to approximately 3 5/8 by 2 5/8 inches. A white cut-border is then added that is approximately 1/8-inch thick. This results in a decal that looks like the image shown at the right. Decals will be printed either portrait or landscape, whichever allows us to create the largest decal within the 4×3 space. Decals require additional handling, and are usually shipped separately from garments. Therefore, decal shipping & handling is charged separately, and IN ADDITION TO garment shipping. For domestic U.S. orders, decal shipping & handling is a flat $2.50 per order, regardless of the number of decals on the order. So, FOR EXAMPLE, if you have an order that includes one t-shirt ($3.00 shipping) and one decal ($2.50 shipping & handling), when you submit the order to Teescape for fulfillment, you would have a total “shipping” charge from Teescape of $5.50. The flat shipping & handling charge for decals shipped to international addresses outside the U.S. is $5.00. As with domestic orders, this also is in addition to the shipping charge for any shirts that may be on the same order. Decals shipped to domestic U.S. addresses are sent first class mail, and will have our generic “Decal Fulfillment Center” for the return address. At this time, we cannot yet include your custom return address on these shipments; however, we do have plans to fix this in the future. The price for decals is simply $1.00 each, in any quantity. Don’t forget to figure in the shipping and handling charge explained above. To begin, create or upload artwork, just like you would if you were creating t-shirts. (You can create decals and t-shirts from the same artwork). 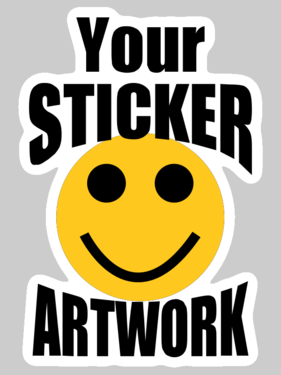 We recommend creating your artwork initially on the default white t-shirt when designing for decals. Once you’ve created your artwork, and click “Add Products With This Design”, on the next page where you select styles, colors, and sizes, scroll down to the bottom and you will see a button labeled “Click To Add Decals Option”. If the little “loading” graphic goes away and you still see the “Click To Add Decals Option” button, click the button again. For technical reasons, sometimes you have to do it twice. Once you see “Standard 4×3 Die-Cut Decal” as a product option, you can click on that and select it the same way you select colors of different shirt styles. We print our decals on high-quality Avery Dennison scuff-resistant, flexible, white premium calendered vinyl film specifically designed for graphic applications. The material offers 100% opacity, a matte finish, great image clarity and color pop. It includes a removable adhesive, and is rated by the manufacturer for up to 3 years durability once printed, and removable up to 1 year (for the easiest removability). It’s also resistant to most mild acids, alkalies, and salt solutions. If you have any questions about decals, please contact us at support@teescape.com.